Concentrated photovoltaïcs is based on an ancient principle. Sunlight is concentrated several hundred times by an optical device (usually a mirror or a Fresnel lense), before reaching the photovoltaïc cell. NREL (National Renewable Energy Laboratory) gives the definition of high concentration when the ratio is over 400 suns. Below this threshold, PV industry appellations are low concentration. Heliotrop is positioned on High CPV, with a concentration of 1024 suns, twice as much as the industry average. Concentration reduces the required cell surface size, thus very little semi-conductor materials is needed (most expensive component of a solar module). Cells used by HCPV systems are most of the time triple-junction, also known as III-V cells. 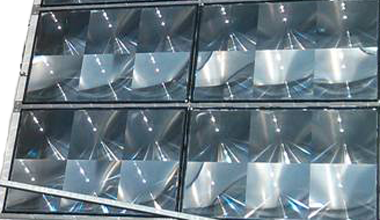 They use an assembly of at least three layers: most used plateform is Ge, InGaAs, InGaP, which allows the capture of a large part of the spectrum of sun light, reaching efficiency over 40%. In addition, temperature sensitivity is much lower than silicon cells, giving them a special advantage on sunny, hot areas. CPV units require Direct Normal Irradiation, thus blue skies and a tracker. The tracker follows the sun throughout the day, with a very high precision (open loop + closed loop). Total efficiency of a CPV module is impacted by other components, such as optical systems and electrical connections. Heliotrop CPV efficiency is above 30%, much higher than other PV technologies. For a comparable size, a CPV module produces much more power than a regular PV panel. Thanks to R&D, targets for Heliotrop systems are above 40% in the coming years. There are three key technologies for solar farms : CPV, CSP, PV. Each technology suits specific market needs and geographical areas, thus each one has its own segment in the solar market. CPV has specific advantages compared to CSP in addition to its much lower price: very little need for water (no need for a thermodynamic cycle, passive cooling), great flexibility for power plant size, opportunity for size increase, flexibility for commissioning (e.g. by sub-segments of 1 MW), time of construction, quicker response to atmospheric events (e.g. production gets quicker at maximum power after clouds). PV may be considered for areas with high part of diffuse irradiation and for smaller power plants with fewer engineering skills available (e.g. roof-tops).